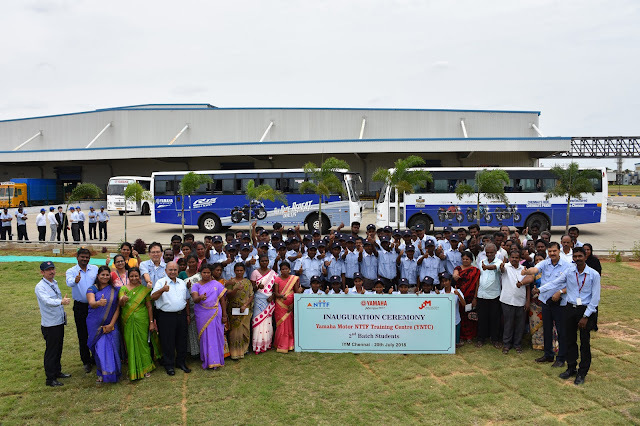 Chennai, July 23, 2018: After the successful induction of students in the 1st batch last year, Yamaha Motor NTTF Training Center (YNTC) announced the induction of 50 students for the 2nd batch today for the academic year 2018-22. YNTC is the first Japan-India Institute of Manufacturing (JIM) established in Chennai in 2017 which aims to train future shop floor leaders with the Japanese style of manufacturing and working methods. JIM is a collaboration between the Governments of Japan and India along with Japanese companies to create a pool of skilled manpower for manufacturing units in India. During the induction ceremony, the students were explained about the four year program which comprises of 2 year Certificate Program in Manufacturing Technology followed by a 2 year Diploma Program. The program will focus on the practical skills in Japanese-style manufacturing, covering nine main areas: Motorcycle Assembly, Parts Control, Paint, Welding, Casting, Machining (in both aluminum and steel), Quality Control, and Utility Techniques. YNTC runs a four-year program in Manufacturing Technology in association with Nettur Technical Training Foundation (NTTF), Vellore an educational foundation aimed at promoting technical education for youth in India. NTTF is responsible for imparting the class room training whereas IYM provides On-the-Job Training to the selected students. The entire program is monitored by a Steering Committee in India. The induction ceremony was carried out in the presence of Mr. R Rajagopalan, Deputy Managing Director, NTTF, Mr. Keiichi Onozawa, Representative of METI for South Asia and Director JETRO, New Delhi, Mr. Mukesh Kumar, Vice President- Manufacturing, IYM, students and parents. After the ceremony, the students for the 2nd batch were handed over the joining letter from the IYM senior management. Tree plantation activity was also conducted along with a plant tour for the new batch along with their parents. YNTC’s 1st batch also successfully completed one year on the Japanese style of manufacturing on July 20th. JIM has been established from a Memorandum of Cooperation (MoC) signed in Tokyo on November 11th, 2016 between Ministry of Economy, Trade and Industry, Government of Japan (METI) and Ministry of Skill Development and Entrepreneurship, Government of India (MSDE), for a “Manufacturing Skill Transfer Promotion Program”. Under this initiative, Japanese Endowed Courses (JEC) will also be introduced in existing engineering colleges to train 30,000 Japanese standard shop floor leaders and engineers over the next ten years.